Before this tour began it would have been impossible to predict just how one-sided the series would be. At every stage England have plummeted to lows they could never have imagined. Yesterday, in the midst of a Symonds inspired riot, England found a new way to illustrate their scrambled minds and find greater depths to sink into – their game plans were leaked. The significance can and will be played down by both sides, but for Australia to have hard copy of England’s carefully-planned strategies for each batsmen is a blow that will tear away at the few fibres of morale the team may still have. The fact that such a document was left around and misplaced is shocking, and illustrates the lacklustre and muddled approach England have had all series. That England does not have the depth in their attack to maintain their plans was perfectly demonstrated yesterday, but full credit must go to Hayden and particularly Symonds, who came in at a tricky time and played a scintillating innings. He managed to defend well initially before launching into all the shots we know he has. For all cricket lovers we hope that this turns out to be his "breakthrough" innings because he brings a panache and flair that is exciting to the game. However he, and many of the batsmen this test match, will be thanking Rudi Koertzen for his dreadful umpiring. England are staring four nil in the face, and will soon be staring into the abyss. I would say that Australia are finishing on a high they never dreamed of, but remembering McGrath’s 5-0 prediction ritual, I guess I’d be wrong. It took 6,273 days to win them back, but just over a year to lose them again. Australia have regained the Ashes. It was promised to be an epic battle, but in truth it was never a contest. This is an Australian side utterly consumed with one goal – winning the urn. Given the challenge of any pivotal session this series, they have surged ahead and left behind a bewildered, shocked England side. I would never have said that one side could have more desire then the other, I thought the Ashes was too big for that. But watching Australia drive through and then celebrate victory, one sensed, that at a level unknown to even the players themselves, Australia needed to win it back more then England desired to retain them. It is easy to say that this was an all-conquering Australian side, complete in every department. However, unlike the sides of the 90s, this one had significant flaws. It was also an ageing side with many playing their last ashes series, but the desire this gave them outweighed the creaks. In truth, England’s grip on the urn slipped from the moment they first grabbed it on that September day. Their focus from that moment has oscillated from basking in the glory, to looking ahead to the rematch. In the intervening period between ashes series, Australia, paused, reflected and then concentrated on improving themselves. They won 12 out of 13 games. 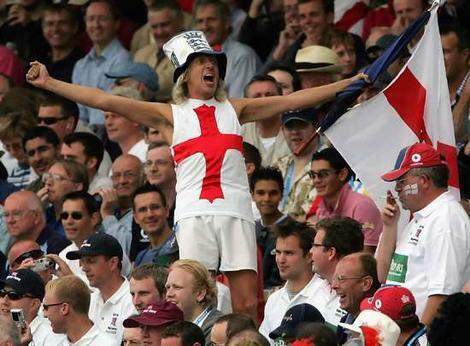 For England, winning the Ashes before 2005 was a mythical, unimaginable end to a cricket side. Reaching that point, they suddenly didn’t know what to do. Rather then continue sharpening their physical and mental skills, they lost focus and won just four out of twelve completed matches. They submitted to a ‘be all right on the night’ attitude for this series. Players spoke before hand about it all ‘clicking in place’, but the sound of ‘clicking’ in test match cricket is months of hard graft and preparation. England arrived with few players who had been through that process. It is no coincidence that the ones who did – Pietersen, Collingwood, Bell, Panesar and Hoggard – have fared well this series. For England fans, tonight is a relief. The agony of hope and despair is finally over. As I said after day 1 in Brisbane, it is hope that feeds the addiction of momentary, wonderful highs followed by long periods of desperate lows. The frustration and anger has now turned to acceptance for me, and the cold rational autopsy now begins. Ashes defeats provide natural watersheds and there deserves to be debate about the future and setup of ‘Team England’ but we should not, again, fall foul to mis-focus. This is a young and talented side and the gremlins that a 5-0 defeat would provide could haunt England for many years. If the recovery of England is to happen, it begins with the first hour of the next session of cricket. It required a Churchillian speech from my grandmother to get me up enough to write today’s entry. The human body must have a natural capacity to defend against pain. For the first time this series I fell asleep during play. It was blissful. I missed Hussey completing his century, then Clarke his and the final showpiece from Gilchrist. I woke up, saw Strauss being triggered again by the theatrical slow finger of Rudi Koertzen, and promptly fell back asleep. I have discussed the tourists non-stop this series, but today, more then any other is not a day for that. (Having watched the highlights!) This was a day for Australia the magnificent. In turn, each ingredient that makes Australia such champions was displayed. First, against spirited bowling Hussey and Hayden got stuck in, determined and hard-nosed. Then, as the opportunity to drive home the advantage developed, Clarke cruised with confidence and control, and finally, when they the game was theirs, Gilchrist unleashed their flair, panache and touch of genius with a stunning 57 ball hundred. This may well be the last test series for many of the Aussie players and they have departed in style. The day was as sad for England fans as it was predictable. There is little more to say then England are not good enough at the moment. Australia are driven enough to make up for their shortcomings and have raced ahead of England every time they tried to get near them. The inevitable post-mortem will point fingers at the coach, but the players must take some responsibility too. Since the 2005 series, the focus and ruthlessness has been lost. Ironically they kept looking to this series instead of the ones they were playing, and they are paying the price for that now. This was, for me, the saddest day of the series. England were brilliant at times yesterday, and even though it was all too late, I felt pleased that we had shown that we could match Australia. But today it finally sunk in that we can’t, not this time. The current mood is best summarised by the Barmy Army Trumpeter, who began they day with ‘The Great Escape’ but ended with Christmas carols. There will be no escape for England in this game or series. Chilling as it is, they will have to strive to avoid a five-nil drubbing. The plaudits will go to Panesar but the real hero today was Cameron Sutherland - the head groundsman at the WACA. This series so far has, inevitably, failed to live up the hype that preceded it. Injuries and and a desperately defensive approach from England have played thier part but primarily it is because the first two tests were played on slow, low, boring featherbeds. It was promised before this test that the once lethally quick Perth wicket had lost its venom and become yet another Australian batsmen's paradise. Thankfully for everyone, the pitch had carry, some pace and occasionally some seam movement. As a result batters could play through the line and on the up, yielding exciting results. 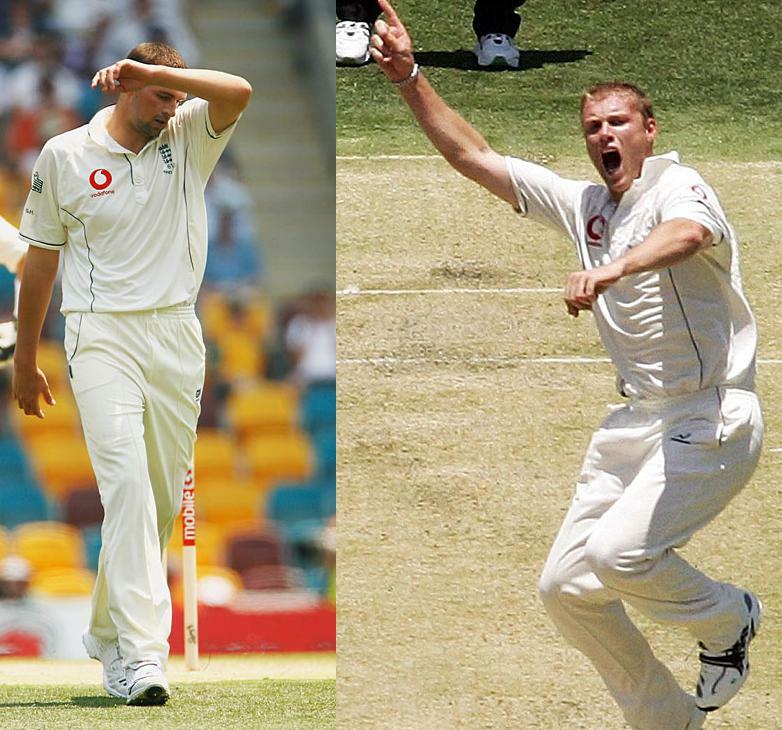 Bowlers could run in with purpose knowing, if they bend their back, the pitch won’t ignore them. It produced an exhilarating days cricket. England, strangely, found themselves free of their self-imposed shackles. With nothing to lose they decided, finally, to play their most attacking side. Ashley Giles made way for Monty Panesar and Jimmy Anderson for Sajid Mahmood. The approach of both sides was different to the previous tests. Australia, just a game away from the Ashes, set out to dominate and crush what they sensed was a vulnerable England team. Hayden, who had spoken bullishly about his plans to go after Hoggard was initially aggressive, but ultimately too frantic as he was found out for the sixth time by Hoggard’s nagging accuracy and cunning. England, as is their sporting heritage, revelled in their backs-to-the-wall position and came out firing. 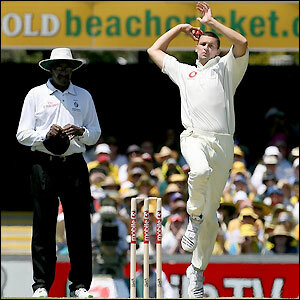 Somehow, Stephen Harmison managed to produce a quick straight ball that defeated the Australian captain. Wickets fell steadily through the day but all the while Mr Cricket was quietly counter-attacking, repeatedly stroking the ball to the cover boundary. The best passage of play was a classic battle between Monty Panesar and Andrew Symonds. Both players were recalled to the side but for Symonds this was last chance saloon. A towering figure and world-beating one-day player, he had yet to make his mark on the test arena. At 31, he won't be given many more chances. He had promised everybody and himself that he would go out and play his natural, destructive game. It was the power of the bludgeoner versus the delicate variations of finger spinner. After a couple of watchful overs he launched Panesar for two towering sixes and a four in an over. It’s the first time that Monty has been genuinely attacked in his career and it left Flintoff with a difficult choice of whether to persist with Panesar. Bravely he kept Monty on, and in his next over, he had Symonds caught behind. It is this sort of aggressive, attractive cricket where both sides are at their best, and is what fans have been craving for all series. In the end, England probably edged the day, but the two late wickets left Australia on a high and as is always the case, the first hour tomorrow will be crucial. To win Test matches, you need to make opportunities and grab them. Australia, for the majority of the time at Adelaide, had been outplayed. It was England who had the opportunities but failed to take them. This test match has exposed two teams with two different approaches. Australia are hungry, motivated and desperate to win the Ashes back. England are desperate not to lose them. It's only a subtle difference of approach, but, when amplified by day-five pressure, it became a devastating rift that saw England become gutless with the bat and then hopeless with the ball. It’s sad for England but cricket is a cruel sport. One bad session cost Andrew Flintoff's men this match, and with it the series. The credit, however, must go to Australia. Seeing an opportunity to scare England on the final day is one thing, but having the unwavering belief and skill to ram home a famous victory is quite another. Here was a team of champions, albeit flawed champions, intent on ending the series as Ashes victors. England needed to score about 100 runs on the final day to be safe. In the dressing room, all the talk would have been of surviving the first hour and then pushing on from there. This is where it went awry for England; you do not just survive on a last-day pitch against Shane Warne. He can build up all the momentum and pressure that way. It took England six overs to get 10 runs in the morning, an approach that played into the super spinner's hands. On paper it seemed painfully obvious – flat pitch, go out there, attack and we’ll write this game off. But the middle is a lonely place for a batsmen; a combination of 11 fielders, 30,000 spectators and the knowledge that one mistake ends your match creates a pressure that is unique to cricket. The muddle in the batsmen's minds was made clear early on with Andrew Strauss wafting outside his off stump. The survival plan came to a tumbling, pointless end with a poor decision from umpire Steve Bucknor, giving the Middlesex man out caught. England had not progressed at all and Australia had a breakthrough. There was no recovery; Paul Collingwood was the only batsman to survive but he could not get the ball of the square and England drifted slowly and painfully towards disaster. Warne, as he so often is, was the master, fizzing and spitting the ball past the batsmen. This, however, is only half of his skill; his presence and will got inside of the England psyche. He had them panicking and he knew it. There was no respite for the tourists, either, as Warne received great support from Brett Lee, Stuart Clark and Glenn McGrath who, seeing the opportunity, backed themselves and raised their games as champions do. It left Australia needing 168 to win from 38 overs. Whilst Australia got off to a flyer, they did lose early wickets. At 33-2 England had a chance of winning the match, but no one in their side believed they could. With Australia needing less than four an over, Flintoff set defensive fields, with men on the boundaries and singles available everywhere. Ricky Ponting and Mike Hussey, under no pressure, collected easy singles as England drifted towards defeat. Ashley Giles, who has built a career on bowling negative dross outside leg stump, suddenly found himself incapable of doing that - bowling short and on the stumps for 10 pointless overs. His place in this side further betrays England’s defensive mindset, but with victories now essential, he surely he must be dropped. Flintoff toiled manfully but had no support and Australia were guided home for a famous victory. It is heartbreaking for England fans, and for cricket fans in general. This was the most hyped-up Test series in history, and after two matches, it's over. No England side has ever come back from 2-0 down to take an Ashes series. We shall of course, stick by them, but they need a fundamental change in approach if they are to compete. For all but one day of this series, they have seemed to lack belief. Their aggressive, attacking instincts have been frozen by what Michael Vaughan called ‘fear of failure’. It is only now that we see how strong Vaughan’s influence was on last year's series. The England management have not instilled a belief in their players and questions must be asked of Duncan Fletcher. His team selection has been wrong, but the errors betray a deeper lack of confidence that has manifested itself in England’s play. It is hard for England, as they played with authority for half this match, even though Australia fully deserve their victory. Arjuna Ranatunga – the Sri Lankan World-Cup winning captain, wrote how cricket is a physical sport decided by strength of mind. Australia’s mindset has been one of complete confidence and aggression, and for that they have been rewarded with the match and with it, surely, the Ashes. England started the day knowing a quick wicket could open the door to a series-levelling victory. The Aussies knew that if they could that overcome this threat they first made the game safe, and then if they batted well enough, create an opportunity to bowl England out. With so much at stake both sides started tentatively. It was England, however, who first hit the mark and, for the first hour, bowled with great discipline, pinning down two of the fastest scorers in the Australian side. England deserved some luck, but found none as catches fell just short and a Hoggard's lbw shout against Gilchrist was turned down. 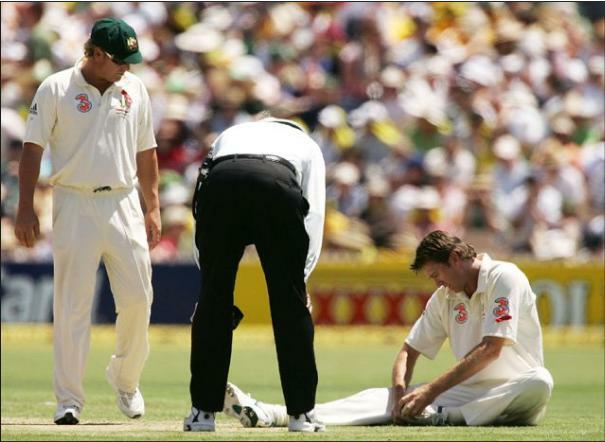 Eventually, Flintoff needed to rest which brought Harmison into the equation. And promptly the pressure released. Harmison has improved from Brisbane, but if even if I turned up to bowl, it would be an improvement from that game. Gilchrist cut loose and Australia dominated the second half of the morning session. England were lucky to get him, just before lunch, when he launched Giles needlessly into the hands of Bell. It brought Warne to the crease and he was welcomed with a volley of chat, that, well, only he could imagine. It was enjoyable to watch, though slightly surprising to see that Warne, who dishes so much out, seemed annoyed about getting some back. It was a brilliant mornings cricket, England were striving for an elusive wicket which seemed just a ball away, before Gilchrist counter-attacked as only he knows how. England continued to be frustrated, particularly by Michael Clarke, who has played as well as I’ve seen him for his impressive 124. He will surely take Martyn’s spot when Watson comes in at number six. It was not until Hoggard removed Warne just before tea and mopped up the tail quickly thereafter that England made any real headway in the day. You will continually hear about Hoggard being an underrated bowler, but anyone who has watched England over the past couple of years will be familiar with his brand of unfashionable, consistent and occasionally brilliant fast-medium bowling. Indeed a glace at the ICC World Rankings, will show he is rated as the fourth-best fast bowler in the world. His bowling here was nothing short of phenomenal, and is likely to be the best performance by a quick bowler this series. The pitch was an absolute grave-yard yet he still ran-in for two days and picked up seven wickets. England were left to survive a tricky 19 overs at the back-end of the day. The only casualty was Cook, who was caught behind off Clarke. Alistair Cook is an mature person and talented batsmen, but he is going through the learning phase that every player has to. England must stick with him even if he continues to struggle, because as Bell is showing, learning in the Ashes may be hard, but you come through it mentally and technically stronger. Warne turned the ball and sledged sharply last night, which sets up yet another crucial morning session. After their dominance for much of this match, England would not want to give the Aussies a sniff of victory in this game. To ensure this they must bat two sessions. In the end this hopeless pitch should be the winner, but provided nothing goes wrong tomorrow, England can draw much confidence from this test match. It is not often that you’re able to compare Ashley Giles to Shane Warne but such was Pietersen’s complete technical dominance over his Hampshire team mate that Warne was reduced to bowling the negative, hopeless around-the-wicket line that made our very own King of Spain famous. We must remember that this pitch is painfully slow and offers absolutely nothing to bowlers of any creed. Indeed New Zealand legend Martin Crowe once remarked on the three certainties of life - death, taxes and hundreds at the Adelaide Oval. But the nature of the hundreds scored by Collingwood and Pietersen was astounding. Whilst yesterday England seemed content on survival, today they took the game to the heart of Australian bowling – McGrath and Warne and left them battered, bruised and with one wicket for 274 between them. Their worst ever return. 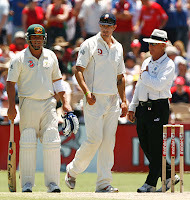 McGrath in particular looked a spent figure, at Brisbane he was flattered by England’s woeful batting but on this pitch he never looked like taking a wicket and was treated with disdain by Pietersen who waltzed down the track to smack him through the leg-side on numerous occasions. As more question marks over McGrath’s fitness presented themselves, so did the perceived weakness of Ponting’s captaincy. Some of his ultra defensive field settings were shocking as England merrily collected runs under no pressure whatsoever. Duncan Fletcher has remarked that Pietersen is one of the smartest cricketers he has ever come across. A quick interview with Kevin will illustrate that it is his cricketing brain that Fletcher is referring to but the way in which he dealt with the ‘Shane Giles’ negative approach was superb. 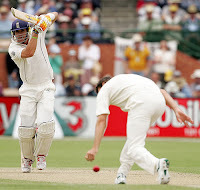 For a player so exuberant and in such fluent form it was not easy to kick the ball away over after over but he kept his head and with the aid of some stunning footwork and balance was able to hit Warne against the spin through mid on, whenever Warne’s negative line erred slightly. It was his best test innings by a distance, and one of the best displays of tackling leg-spin that you will ever see. Australia may have regretted playing four bowlers on the best batting wicket in the country, especially after the England bowlers could only muster up 9 wickets for 804 in Brisbane. But England, may well rue the similarly conservative selection of Ashley Giles. For them to take 20 wickets and win this match would be a remarkable effort, for greater then the brilliant batting display – and Panesar’s presence would have helped. What followed was England’s best passage of play this series, giving themselves nine overs at the back end of the day to have a go at the Aussies. It is not easy coming out to bat after 168 overs in the field and England took full advantage. They were aggressive, lively and right up at Australia. Flintoff crucially took the new ball and got the reward of Justin Langer caught off a rising delivery. When at his best, our captain is one of world’s premier fast bowlers and if England are to square the series here in Adelaide, his performance will be the difference. England were given everything they could have asked for today, but lacked the decisiveness or confidence to take full advantage. The conservatism directing England’s batting display was evident before the game began with Flintoff announcing an unchanged side. Many have argued that leaving out Monty Panesar was simply the result of a stubborn, pig-headedness of Duncan Fletcher. This may not have been the case. It remains a defensive selection but the reasons behind it may more subtle than many will give the coach credit for. A change in selection policy after one, admittedly terrible, match may have sent signals to the opposition that they had upset England’s plans early on in the campaign. Australia has gone down a similar, ill-judged route. Keen to disprove to everyone that they are not an aging ‘Dad’s Army XI’ they played a half-fit McGrath. His presence in the field alone cost Australia two vital wickets – a run out of Collingwood and on the penultimate ball of the day, a tired missed catch off a Pietersen hook. The later miss may prove to be the difference in the match. Despite the combination of an unfit McGrath, an out of form Lee and a first day pitch that most batsmen would spend their time dreaming about, England failed to win the day. They started appallingly, with Strauss (14) and Cook (27) playing themselves in, before getting themselves out tamely, to leave England 45-2. England improved from there but Bell and even Collingwood initially batted for a session as if it were a net. On an easy paced pitch where 480 should be par, England seemed overly content with occupying the crease; even if it meant letting the game drift aimlessly. Half volleys were patted straight to fielders and there was no urgency in the running between wickets. When Bell was finally dismissed for a hard-graft, though undamaging 60, Pietersen took to the crease and inject purpose into England’s performance. His battles with Shane Warne made compelling viewing, and aside from Tendulkar in India, few have ever played Warne better. Like Ricky Ponting, Pietersen picks up length so early, that if a bowler errs even slightly short, he can rock back and cut with power and precision. It is momentum that affects the pressure and the mental resolve of each side. The problem for England is, with the approach they adopted for most of the day, they did not shift the momentum. If they had been bolder and shown greater belief in themselves, they could have clawed back the momentum from the opening test – as they did at Edgbaston in 2005. As it is, if England lose two quick wickets tomorrow, the momentum will be entirely with Australia and England would have gained nothing. Predictably though, the good score could not temper the overblown reactions of the media or many armchair barmy army, who had abandoned all hope day before yesterday, but have now returned to full voice. For the rest of us, we can breath a sigh of relief that after the first day, we are still in the game. The first hour tomorrow, as always, will be vital. If Collingwood and Pietersen can complete and then build on centuries then it could give a chance for Flintoff to finally ‘express himself’ against the old ball. Five hundred is not enough to win this test match but England are more then capable of reaching a total that can.